St. Louis teenager Tom Hartman really, really worshiped the Beatles. Why, he loved them so much that when his own band, the goofily named Aerovons, desired to secure a recording deal, he boldly insisted that no record company was good enough for his band but his idols' own U.K. label, Parlophone (he even spurned an offer by the Fabs' American label, Capitol, his Anglophilia being that intense). Befitting a teenage boy's outsize pluck, not only did Hartman get his way, securing a contract with the EMI imprint, in 1969 the Aerovons also were ensconced in London for sessions at EMI's Abbey Road Studios, with the 17-year-old singer-songwriter-guitarist-keyboardist himself installed as producer. Suffice to say, the Aerovons had several encounters with the Beatles themselves in the hallowed halls, as the older group was in the midst of recording its swan song, Abbey Road. The results of their eavesdropping on the Beatles' sessions are abundantly clear in the songs the Aerovons recorded at the time, a couple of which bear uncanny similarities to their role models. The feel of "Resurrection," and especially its chorus hook, are straight from "Across the Universe," and if you place the Aerovons' "Say Georgia" facing "Oh! Darling" like a couple of mirrors, they would refract into infinity. Strangely and anachronistically, the Aerovons' 1969 sessions plumbed all eras of Beatledom: Ballads such as "With Her" and "The Years" could have appeared on A Hard Day's Night and Help! respectively, abetted by Hartman's McCartneyesque pipes. Mid-period Beatles pop-sike such as "She's Not Dead" and especially the resplendent "World of You" (one of the group's few tunes to be issued in its lifetime, as a Parlophone single in 1969) cover the Fake Beatles gamut. The only other 45 issued, also in '69, was a bit of bogus Bee Gees called "The Train." An entire album of 12 songs, to be called Resurrection, was prepared and even sequenced by Parlophone but was canned when the group fell apart upon return to the States, with only the two singles as evidence of their command of the idiom. Fortunately for Fake Beatles hunters such as this writer, the entire LP was issued (with singles and a couple of bonus tracks) in 2003, with the name Resurrection taking on even more import upon its release almost 35 years late. 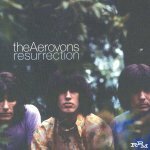 Please go to the Aerovons' official site at www.aerovons.com to stream several of their songs, including many discussed in this post. thank you, gaylord. i indeed discovered tom and his celebrated 'reissue' cd about 5-6 years back on a beatles newsgroup. love it lots. i enjoy this more than the beatles. Who ripped off who,,,??? A persistent rumor has it that "Say Georgia" and "Resurrection" were swiped by the Beatles for "Oh, Darling" and "Across the Universe," ...... So who was listening to who at Abbey Road?????? An interesting imitation of the original band gaylord.